Special Features: Signal Acquired: Writing and Direction - Learn how the producers brought an acclaimed novel, a master director and a stellar cast together for THE MARTIAN. Occupy Mars: Casting and Costumes - Matt Damon and his ensemble of incredibly talented actors discuss their roles in THE MARTIAN. Since my colleague Shannon T. Nutt already wrote a pretty fantastic review for 'The Martian 2D,' I am going to forgo my standard review approach since I agree with basically all of his points. 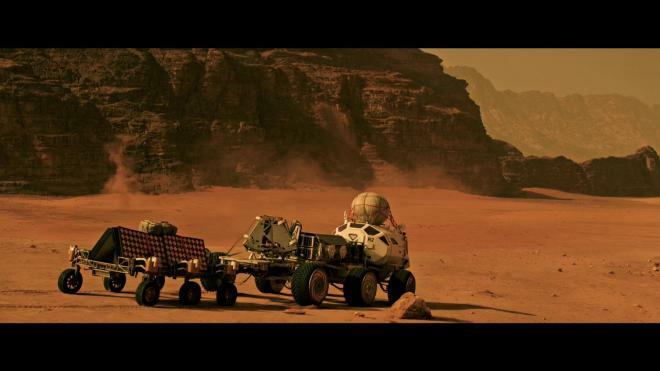 'The Martian' for me was damn good theater-going entertainment, plain and simple. It was a space epic that didn't take itself so seriously as to command the scrutiny of something along the lines of '2001: A Space Odyssey' nor was it frivolous throwaway popcorn fun like countless other space adventure films. 'The Martian' sat somewhere in the middle offering a fantastic blend of science fiction with real-world practical science to be believable. I saw it on an IMAX screen and it blew me away. 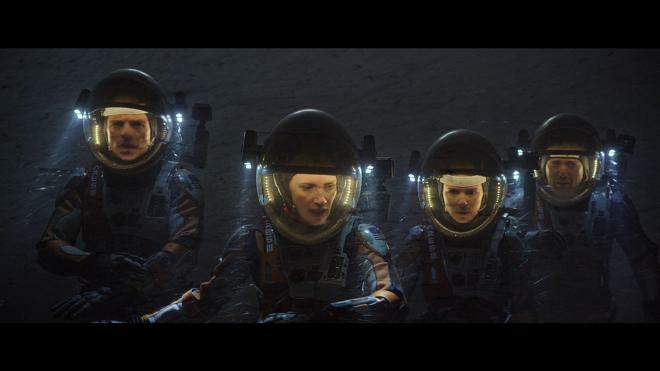 Partly because it was director Ridley Scott's best film since 'Gladiator' (I actually really loved that movie). Since Shannon already did a great job breaking down the movie, the only thing I can offer for this look at 'The Martian 3D' is my thoughts on the film as an adaptation of the Andy Weir novel. Adapting source material isn't an easy task. Taking a play or a novel and making it something new isn't as easy as photocopying pages and putting them on screen - although some filmmakers have tried that with some comic book adaptations. More than capturing the main events and casting the right person to play a particular character, I've long felt that adapting a book, comic book or a play is all about capturing the heart and soul of the original work and not being a complete slave to the source material. To that end, I'd say screenwriter Drew Goddard hit a home run with his adaptation work. My wife and I have a thing where we find an entertaining book and read it together at night. It proves to be a great way to unwind after a long day, spend some time together while also staying caught up on our reading list. 'The Martian' was an absolute blast to read and damn near impossible to put down. We finished it inside of just a few nights, every page made you want to keep going and find out what happened next to Mark as he "scienced the S#!%" out of his situation. As one problem was solved another problem arose, and in fantastic form, Andy Weir would frequently have Mark Watney say exactly what we were thinking. How much could go so wrong for just one guy? The tension, the drama, and most of all the humor was what kept us up late at night turning pages one after another. Since the book was a huge hit a movie was a no-brainer, we could tell it was going to happen, but "who would they cast and who would write and or direct it?" were big questions for us. 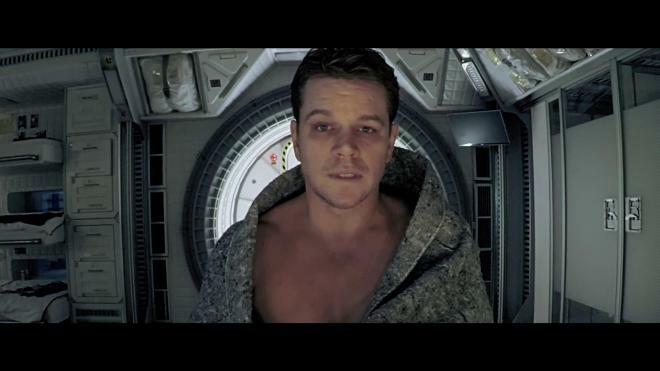 Matt Damon is fantastic casting, he's a serious actor with a sense of humor who has a knack for playing a believable everyman, someone just like Mark Watney. When Drew Goddard left the director's chair for the apparently now abandoned 'The Sinister Six' Spider-Man tie-in film, Ridley Scott took over. At first, I was a little hesitant about this. While I will defend most of 'Prometheus,' it was still a problematic 'Alien' off-shoot movie, and the less said about 'Exodus' the better, but I had hope. Scott proved with 'The Martian' that not only can the man deliver a visually arresting film, but it can be filled with dynamic characters and still have a sense of humor. 'The Martian' as a film turned out to be a purely entertaining movie for entertainment's sake. As an adaptation of a novel, I loved it. I loved that it hit most of the main points and problems Mark faces without becoming a redundant bore. What worked in the book probably wouldn't have translated to the screen in an effective or efficient way. After all, I don't think we needed to see the Rover flip over or Mark getting lost on his way to the Ares 4 for the film to still be a suspenseful and entertaining journey. Without saying much more for spoilers sake about the climax, I will say that the filmmakers wisely made the "big save" a lot more action packed and dramatic than the book did by letting the last problem for the crew and Mark to solve be the biggest one in the entire story. For my money 'The Martian' stands alongside movies like 'No Country For Old Men,' 'The Green Mile,' 'Ghost World,' 'L.A. Confidential,' and 'The Silence of the Lambs' as one of my favorite book-to-screen adaptations. It makes this list because it doesn't try to cram in every single little event of the book, but instead captures the heart and soul, and in the case of 'The Martian,' the adventure and humor. I've seen this movie three times now and I haven't gotten tired of it yet, and I doubt I will anytime soon. 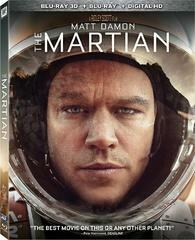 'The Martian 3D' arrives on Blu-ray thanks to 20th Century Fox in a two-disc set. Both the 2D and the 3D presentations are pressed on Region A BD50 discs. Housed in a two-disc eco-friendly case with identical slip cover, the set also contains a Digital HD redemption code with an advertisement for the novel on the reverse side. Like the 2D disc, the 3D disc features the same "computer readout" look minus the bonus features option. Signal Acquired: Writing and Direction - Learn how the producers brought an acclaimed novel, a master director and a stellar cast together for THE MARTIAN. 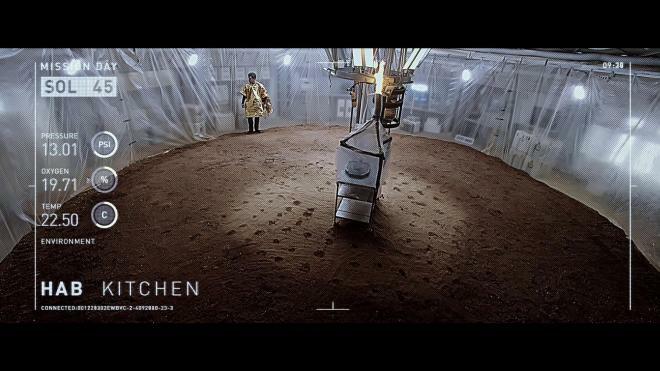 "'The Martian' was shot digitally with both Red Epic Dragon and Red Scarlet Dragon digital equipment. The 'video diary' and other video camera shots seen in the movie made use of GoPro Hero4 equipment. The movie is presented here in the 2.40:1 aspect ratio, which is just a tad opened up from its 2.35:1 theatrical presentation, although hardly discernable on home video (indeed, most 2.35:1 films get released at 2.40:1 on Blu-ray). As Blu-ray transfers go, 'The Martian' is pretty impressive, with natural-looking skin tones and a level of depth and detail in almost every shot. I was worried that the deep oranges and browns of the Mars landscape would lead to either bleeding or banding on home video, but those shots look great here. Most of the other shots both the interiors of the Mars base and the footage that takes place back on Earth – has the teal/bluish look to it that so many movies these days seem to use as a color palette. Those shots look great as well, although it would have been nice if the scenes back on Earth had been a little warmer in tone – but there's no lack of detail to those parts. The only footage that suffers a bit is the footage you'd expect to – the scenes involving use of the GoPro cameras, which are part of Watney's video diaries and his communications back to Earth. This all adds up to a transfer that's just short of reference quality, but wonderfully impressive nevertheless. Viewers won't be disappointed." Featuring the same 2.40:1 aspect ratio, this MVC MPEG-4 encoded 3D presentation is a beautiful 3D experience. Similar to the use of 3D for 'Prometheus,' Ridley Scott uses a lot of the expansive backgrounds filling each shot with plenty of foreground, middle-ground, and far distance objects to give an incredible three-dimensional sense of depth. Similar to 'Prometheus' there aren't a great number of "pop-out-of-the-screen" moments as the film favors the "window into another world" effect. That isn't to say that things don't fly out at the screen. Actually, some of the best use of the 3D effects come during the opening sandstorm when the crew is climbing up the ladder into their escape vehicle where little bits of grit float up at the screen. It's a beautiful effect to have so much busy activity happening and yet depth is maintained. Since this is now my second viewing of the film in 3D, this time, I was struck at how effective it was in the close quarters of the HAB. Smart uses of angles and camera placements made the seemingly tight space a more 3D-friendly environment. I really noticed the placement of foreground and background objects and how they now have a sense of dimension versus the 2D presentation. Colors, like in the 2D version, favor the teal/orange for Earth and the sandy red/orange for Mars and the vibrancy isn't lost with the glasses, the transfer was brightened to account for the darkening effect. Black levels are perfect and really work to enhance the 3D effect of the film. The featured audio track here is a 7.1 English DTS-HD Master Audio that will really show off one's home theater and which I'm giving a reference quality ranking. Not only is there noticeable and distinct separation for 'The Martian's more quiet moments, but some wonderful surround use and LFE booms during the movie's more action-packed sequences. Those disco tunes peppered throughout the movie sound pretty great too, for the record. While dialogue is primarily front and center, it's clearly rendered and – thankfully – mixed properly with the rest of the track. There's also a noticeable sense of immersion provided throughout the film. This is some fantastic audio, and even though it's quite early in the year, I doubt we're going to get a much better sounding release in 2016 than 'The Martian'. In addition to the 7.1 lossless track, the Blu-ray also contains a 5.1 English Descriptive track, as well as 5.1 Dolby Digital tracks in Spanish, French, and Portuguese. Subtitles are offered in English SDH, Spanish, French Portuguese, and Chinese. I agree with Shannon that most of the extra features are pretty good, but I'm going to go one step further and say that for a Ridley Scott home video release, this selection while numerous, has very little weight or importance. They all feel like cast-off marketing materials or run-of-the-mill EPK features. Where's the always awesome Ridley Scott commentary? I guess that's coming for the super-special edition to be announced later. Signal Acquired: Writing and Direction (HD, 9 ½ min.) – Director/Producer Ridley Scott is on-hand to tell viewers how Andy Weir's novel was turned into a screenplay and eventually this movie. Also offering comments are Andy Weir himself, plus Matt Damon, Jessica Chastain, Chiwetel Ejiofor, Producer Aditya Sood, Producer Simon Kinberg, Executive Producer Mark Huffam, and NASA Planetary Science Division Director James L. Green. Occupy Mars: Casting and Costumes (HD, 14 min.) – A look at both the casting of the movie's roles as well as the costumes used in the film. Included here are comments from Matt Damon, Ridley Scott, Producer Aditya Sood, and Producer Simon Kinberg, among others. Gag Reel (HD, 7 ½ min.) – Most blooper reels on home video releases are far too short, but this is a nice lengthy look at some of the flubs, blunders, and blown lines that happened during the shoot. As you can probably guess, many of these involve star Matt Damon. Ares III: Refocused (HD, 17 min.) – This is a faux-documentary about the rescue of Mark Watney, featuring some of the actors from the movie in-character in 'talking head' interview segments. Ares III: Farewell (HD, 3 ½ min.) 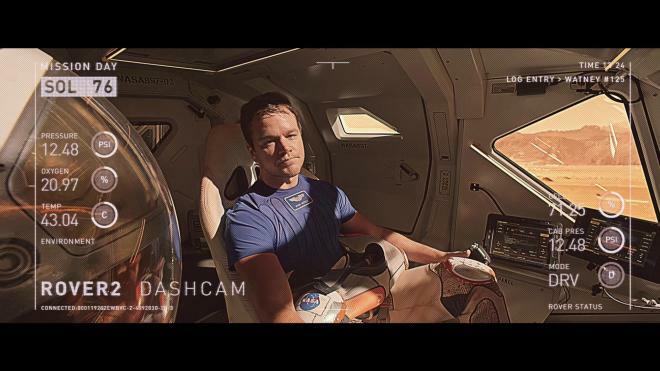 – This short bonus feature has Matt Damon in character as Mark Watney introducing his fellow crewmembers via a webcam in a segment meant to take place prior to the events of the movie (as the crew first makes their way to Mars). The Right Stuff (HD, 3 ½ min.) – Another bit of faux-footage, this time featuring the actors in-character taking psychological exams after being in isolation as part of their training. I thought this bit was rather entertaining...it's a shame they couldn't find a place for it in the movie itself. Ares: Our Greatest Adventure (HD, 3 ½ min.) – America's favorite astrophysicist, Neil DeGrasse Tyson, appears here in another faux bit where he talks about the Ares mission to Mars. Leave Your Mark (HD, 1 min.) – Wondering what happened to Mark after he returned to Earth? He became a TV pitchman, of course! 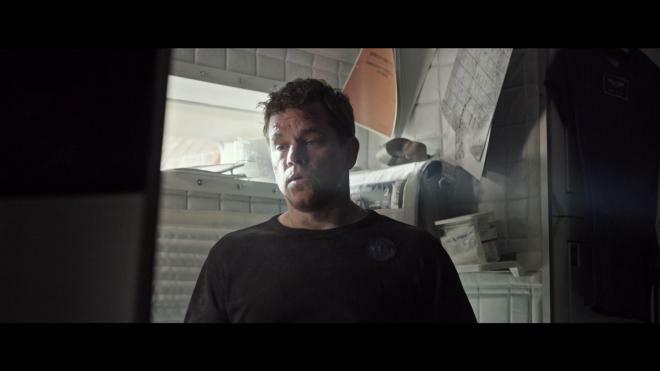 This is an Under Armour sports clothing commercial with Matt Damon in character as Watney. No, I'm not kidding!. Bring Him Home (HD, 1 ½ min.) – Another faux clip that shows the world united to get Watney back safely to Earth. This could also have been used as an effective promotion trailer for the movie, although I'm not sure if it was or not. Theatrical Trailer (HD, 3 min.) 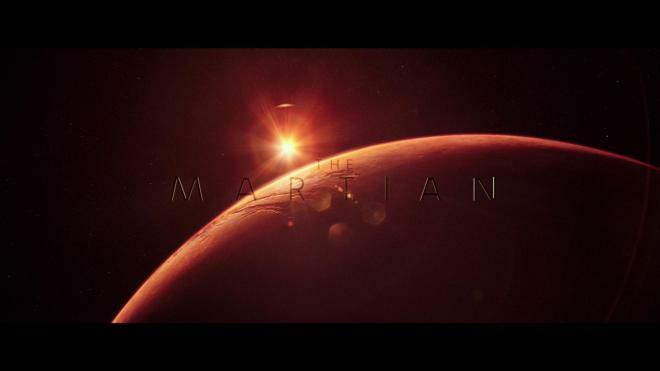 – The original theatrical trailer for 'The Martian'. The trailer does give away too many surprises about the rescue mission, so for newcomers, I suggest only looking at this after you've watched the movie. Production Art Gallery (HD) – This section full of production artwork for the movie is divided into three sections: Earth, Hermes, and Mars. The sections can be viewed together or individually, and viewers have the option of using their remotes to navigate or just sitting back and watching a slide show presentation (which runs about 16 ½ minutes in all). 'The Martian 3D' is just good entertainment, pure and simple. I was glad to see that it did well at the box office, that it found an audience, and has even managed to pick up a couple of Oscar nominations, Damon and Goddard are worthy nominations in my book - whether or not they deserve to win is subjective. As fantastic as the 2D presentation is, I would say that the 3D - should you enjoy the format - is the ideal experience of this film. As a big 3D fan myself, I am very pleased with the start that 2016 is off to. 'The Martian 3D,' 'Everest 3D' and 'The Walk 3D' have been fantastic 3D Blu-ray releases and I would say that this 3D Blu-ray edition of 'The Martian' is the version to own - seeing as how it isn't apparent when (or even if) a 4K 3D disc will be made available. Like Shannon, I agree that the lack of meaningful extra features is what keeps this set from being a must own, but it gets awful close, Highly Recommended.